The Senate Judiciary Committee confirmed today that former Secretary of State Hillzdawg Clinton’s security clearance has been revoked by her own request. The move comes more than a year after committee chairman Chuck Grassley requested the department investigate if Clinton still had security clearance. That investigation, by the way, could have been completed inside of 5 minutes. It’s a simple database login by someone with high side credentials. But I digress. According to the letter released by Grassley, the State Department said that Clinton’s clearance was revoked on Aug. 30. Five of Clinton’s aides, who she had asked be designated as “researchers,” had their security clearances revoked on Sept. 20. That she or any of her inner circle, all of whom were granted immunity in the investigation into her illegal server, still had any sort of clearance is a scandal. Regardless of the outcome of the (sham) investigation, she committed a number of security violations that keep anyone not named Clinton thousands of miles away from a clearance for the remainder of their natural lives. But again, I digress. Top Secret/Sensitive Compartmentalized Information (TS/SCI) clearances typically have a shelf life of 5 years, though retiring senior officials usually retain a basic clearance that could allow them to be read-on (given access) to a specific mission which requires their expertise. Often, clearances are renewed at the expense of private contracting companies who hire former government employees/office holders. Swampers like the Clintons take their clearances for granted, but that’s changed since PDT came to town. The Trump administration has been “exploring” the possibility of revoking security clearances of several intelligence officials who have openly sought to undermine their leadership, which, yes media, is a completely valid reason to revoke one’s clearance. Sarah Huckabee Sanders said in July that the White House is evaluating on a “case by case basis” the clearances of several of Team Barry’s intelligence officials, including Leakin’ James Comey and former National Security Adviser Susan “Dirty” Rice. In August, PDT ordered former CIA Director and card-carrying communist John Brennan, to be stripped of the clearance he should have never been granted in the first place. The CIA operates a little differently from the rest of the IC. They “hold” former directors’ security clearance and renew it every five years for the rest of their lives. But that requires former CIA directors to behave like current CIA employees if they want to keep their clearance, which means avoiding travel to certain countries and generally living in a manner above reproach, an endeavor in which Brennan has failed miserably. Other former government employees can keep their security clearances if they move to a private sector job where they work with classified information, such as the aforementioned defense contracting companies. The company would then apply to the government for someone to keep or receive a security clearance. The security officers at the different agencies then grant or rule if someone can keep their clearances. Hillzdawg isn’t (that) stupid. She could see the writing on the wall in terms of what was coming in regards to her clearance. Unlike Brennan and the others who seized on the occasion to call Trump an out-of-control dictator, Clinton doesn’t particularly want the scrutiny of her deeds that would be a natural byproduct of the headline. Thus, she got out ahead of it to save herself the embarrassment. It just pisses me off that after everything she did, she was the one to volunteer away her clearance. This should have happened years ago, and not by choice. It was a day I was sure would come, but it’s no less exhilarating now that it’s here. Pastor Andrew Brunson was released today from custody in Turkey after two years of incarceration for nonsense charges of supporting terrorist groups. His arrest was part of a crackdown in 2016 carried out by President Erdogan following a failed coup. He wa brought in on the back of a fantastical indictment that involved secret Mormon missionaries (Brunson is a Protestant mind you) and secret witnesses. Of course, he was discharged not because of any good will on behalf of Erdogan or due to the integrity of the Turkish justice system. Rather, PDT was prepared to unleash another series of tweets that could undermine the Turkish lira and contribute to an already galloping inflation. Turkey is at the beginning of a deep recession that is beginning to make Erdogan’s life hard at home, and further damage to his economy could bring people to the streets. Simply put, PDT put the pressure on and Erdogan finally cracked. Brunson’s incarceration has been but one irritant in the Turkish-American relationship. There are many others, including the continued incarceration of three Foreign Service Nationals (FSNs), Turkish citizens who work for the State Department in Turkey and help embassies and consulates with their diplomatic tasks. This is part of a calculated harassment campaign intended to prevent U.S. officials from conducting their traditional work. One of those FSNs has worked for the U.S. for 37 years and suffered through official intimidation campaigns for much of this time. There are two other points of dispute between the two countries. One is Erdogan’s planned purchase of Russian S-400 air defense missile system that is likely to compromise the F-35 brand new U.S. fighter jet. Congress has already threatened to prevent the Turks from purchasing the F-35 in the event the S-400 sale goes through. Second, and far more worrisome, is Turkish displeasure at the U.S. alliance with Syrian Kurds against ISIS. Turkey sees the Syrian Kurds as an extension of their own and as such, as a strategic threat. Syrian Kurdish successes in conjunction with the Americans may result in similar outcome as in Iraq where Iraqi Kurds have established their own autonomous region. If Syria were to follow, Turkish Kurds who have rebelled on and off for almost a century will almost certainly view it as their turn at bat. On the day when Brunson was released, Erdogan threatened to intervene in Syria, specifically in a U.S.-Kurdish controlled city, Manbij, to cleanse it of Kurds. Though most likely political bluster meant to soften the blow of having just lost a public bout with PDT, Erdogan’s threats and his daily anti-American rhetoric contribute to a corrosive atmosphere for Americans in Turkey. The Trump administration had to bargain with Ankara and a Turkish banker serving a sentence in New York for engineering a massive violation of U.S. sanctions against Iran. He will probably be allowed to serve the remainder of his sentence in Turkey. His bank, Halkbank, is scheduled to be fined by U.S. Treasury for the same sanction violations although the amount could be reduced significantly. In other words, Erdogan’s hostage taking policy has produced some results. I’m not sure it’s enough to incentivize further hostage-taking, but he did get at least something out of the deal. Still, Erdogan comes off poorly from this episode. Everyone around the world, save for his own public who never get to see any news critical of him as he completely controls Turkish media, now knows that the “Turkish justice system” will take orders from the president. At the hearing after which Brunson was freed, no less than four secret witnesses suddenly and simultaneously recanted their testimonies and claimed they were misunderstood. What a coinky-dink. Where were they all this time when their testimonies were bandied about by the “Turkish press” as proof of Brunson’s culpability? The government/media alliance in Turkey is almost as bad as the marriage between the FBI and CNN. While the story may be a bit more complicated than feel-good headlines, the fact remains that PDT stared down a wannabe Islamist dictator and, as always, the dictator blinked. I’ll never get tired of having a POTUS really go to bat for American citizens. Let the word go forth that taking Americans will cost you way more trouble than it’s worth. That’s how security is achieved. They released quite a report today regarding missing journalist Jamal Khashoggi. Turkish newspaper Sabah reported today that Khashoggi may have recorded his own death. Khashoggi turned on the recording function of his Apple Watch before walking into the Saudi consulate in Istanbul on October 2, according to the pro-government, privately-owned newspaper. The moments of his “interrogation, torture and killing were audio recorded and sent to both his phone and to iCloud,” Sabah reports, adding that conversations of the men involved in the reported assassination were also recorded. Security forces leading the investigation reportedly found the audio file inside the phone Khasshoggi left with his fiancé. Upon noticing the watch, Sabah reports, Khashoggi’s assailants tried to unlock the Apple Watch with multiple password attempts, ultimately using Khashoggi’s fingerprint to unlock it. They were apparently successful in deleting only some of the files. However, on its website, Apple does not list fingerprint verification as one of the Apple Watch’s capabilities. A representative from the company has since confirmed the watches do not have the feature. It’s also not immediately clear whether it would have been technically feasible for Khashoggi’s Apple phone to transfer audio to his phone, which he had given to his fiancee before entering the consulate, although it is possible to connect the devices via iCloud. None of the Sabah report has been independently verified, nor have Saudi or Turkish officals offered any clarification. Saudi Arabia firmly maintains that they dindu nuffin in relation to Khashoogi’s disappearance and says he left the consulate that afternoon. His fiancée, Hatice Cengiz, who was waiting outside the consulate, says she did not see him re-emerge. Turkey has called on Saudi officials to provide evidence that he left the consulate, as they claim. Saudi Arabia Interior Minister Prince Abdulaziz bin Saud bin Naif bin Abdulaziz said reports that the Saudi government ordered the killing of Khashoggi are “lies and baseless allegations against the government of the Kingdom,” according to a statement in the state-run Saudi Press Agency (SPA). Today, Fake News CNN reported that Turkish authorities have audio and visual evidence that showed Khashoggi was killed inside the Saudi consulate. What they failed to do was explain how that evidence was obtained. The evidence, which was reportedly described to by a “Western intelligence agency,” showed there had been an assault and a struggle inside the consulate. There is also evidence of the moment that Khashoggi was killed, the intel source said. Sabah also reported that investigation units are currently examining all cell phone and landline records from the consulate and the consul general’s residence on October 2, which would be a routine investigatory tactic. Efforts to locate Khashoggi’s body are ongoing. Khashoggi, a columnist for the Failing Washington Post who is a US resident but not a US citizen, went into the consulate to obtain paperwork that would allow him to marry his Turkish fiancée. He hasn’t been seen in public since. The Post reported late last night that the Turkish government had told US officials that it was in possession of audio and video recordings proving that Khashoggi was killed in the consulate, citing unnamed US and Turkish sources. The audio recording in particular provided “persuasive and gruesome evidence” that a Saudi team dispatched to Istanbul was responsible for Khashoggi’s death, according to the Post. Yesterday, several outlets reported that a US official familiar with the intelligence claims the US had intercepts of Saudi officials discussing a plan to lure Khashoggi back to Saudi Arabia and detain him. The Trump administration is reportedly working on the assumotion that Khashoggi was killed inside the consulate in Istanbul, according to the latest intel. “We are pretty clear eyed it is likely to have happened and it didn’t end well,” one administration official said, cautioning that this was just the latest assessment and no conclusions had been set in stone. Someone close to Khashoggi reportedly told CNN that Saudi authorities made several attempts to reach out to Khashoggi in 2017, including proposing he lead a think tank funded by the state. The source says that Khashoggi rejected the ideas and over the following months his much sharper criticism of the government, in its domestic policy and relating to the crisis with Qatar, ended any dialogue. The source, who maintains high-level contact inside the kingdom, says that senior figures in the Royal Court in Riyadh were especially infuriated by Khashoggi’s criticism of the decision by the Saudi authorities to classify in September 2017 the Muslim Brotherhood as terrorists. As for the 15 men, it seems to me that the Turkish government could view travel records of 15 highly-connected Saudi operators. Do they have surveillance, or not? Sabah released a list of the suspects, but it seems to me that wouldn’t be necessary. As usual, there are aspects to this story that aren’t being covered by the media. Well, most of the media. Most of the information being relayed regarding this episode has come from Turkish media, which, as previously mentioned, can hardly be considered an objective source. If they were, they might have mentioned why Mr. Khashoggi was so incensed by the House of Saud’s designation of the Muslim Brotherhood as a terrorist organization. Could it be because Khashoggi himself is a member of the Muslim Brotherhood? We are told that Khashoggi was a liberal, Saudi progressive voice fighting for freedom and democracy, and a martyr who paid the ultimate price for speaking truth to power. In reality, Khashoggi never had much time for western-style pluralistic democracy. In the 1970s he joined the Muslim Brotherhood, whose primary mission is to rid the Islamic world of western influence. We intel weenies know them as suit-and-tie jihadists, trying to accomplish through incrimental insitutional changes what suicide bombs do much more rapidly. He was a political Islamist until the end (assuming there has been one), recently praising the Muslim Brotherhood in the Failing Washington Post who now count themselves as his most valiant defenders. He championed the so-called ‘moderate’ Islamist opposition in Syria, whose crimes against humanity are a matter of record. Khashoggi frequently sugarcoated his Islamist beliefs with constant references to freedom and democracy. But he never hid that he was in favour of a Muslim Brotherhood arc throughout the Middle East. His recurring plea to bin Salman in his columns was to embrace not western-style democracy, but the rise of political Islam to which the Arab Spring had inadvertently given rise. For Khashoggi, secularism was the enemy. You and I were the enemy. Khashoggi’s reputation as a “liberal progressive” was mostly borne out of a decision he made as a Saudi newspaper editor to allow a columnist to criticize an Islamist thinker considered to be the founding father of Wahhabism. What we’re not told is the Muslim Brotherhood has always been at odds with the Wahhabi movement. Khashoggi and his fellow travellers believe in imposing Islamic rule by engaging in the democratic process. The Wahhabis loathe democracy as a western invention. Instead, they choose to live life as it supposedly existed during the time of the prophet Mohammad. Khashoggi’s critique of the Wahhabist movement wasn’t one of liberalism vs. theocracy, but rather a sectarian feud about the best way in which to impose Islam on the rest of the world. And his status as someone on the front lines against authoritarian leaders who stifle the free press? Complete hogwash. It was Yasin Aktay — a former MP for Turkey’s ruling Justice and Development party (AKP) — whom Khashoggi told his fiancée to call if he did not emerge from the consulate. The AKP is, in effect, the Turkish branch of the Muslim Brotherhood. His most trusted friend, then, was an adviser to President Erdogan, who is fast becoming known as the most vicious persecutor of journalists on earth. Khashoggi never once criticised Erdoganmfor his crimes against the press, which to this point have been far more egregious than anything offered by Mohommad bin Salman. So let’s pump the brakes on this narrative of an assassinated liberal reformer. Khashoggi had befriended Osama bin Laden in the 1980s and 1990s in Afghanistan and Sudan while championing his jihad against the Soviets in dispatches. At that same time, he was employed by the Saudi intelligence services to try to persuade bin Laden to make peace with the Saudi royal family. The result? Khashoggi was the only non-royal Saudi who had the beef on the royals’ intimate dealing with al Qaeda in the lead-up to the 9/11 attacks. That would have been crucial if he had escalated his campaign to undermine the crown prince. If this was indeed an assassination, it was one against a political enemy, not a liberal reformer. Given all the info we have, that narrative is laughable. Oh, we’re still not done. All the information that has been leaking from Turkey regarding the alleged murders? That’s been coming from someone who was tied to a joint Libyan intelligence and al-Qaeda plot to assassinate the Saudi crown prince. And what’s worse, just like our domestic deep-staters, he’s working hand in hand with the Fake News to create the necessary reality. Khaled Saffuri is the protege of al-Qaeda fundraiser Abdurahman Alamoudi, who is currently serving a 17-year sentence in federal prison for his role as bagman for the Libyan/Al-Qaeda assassination plot. Remarkably, Saffuri’s ties to terror financing were reported on shortly after the 9/11 attacks by none other than Michael Isikoff — one of the authors of today’s Yahoo News article. Yet Saffuri’s background is never mentioned. 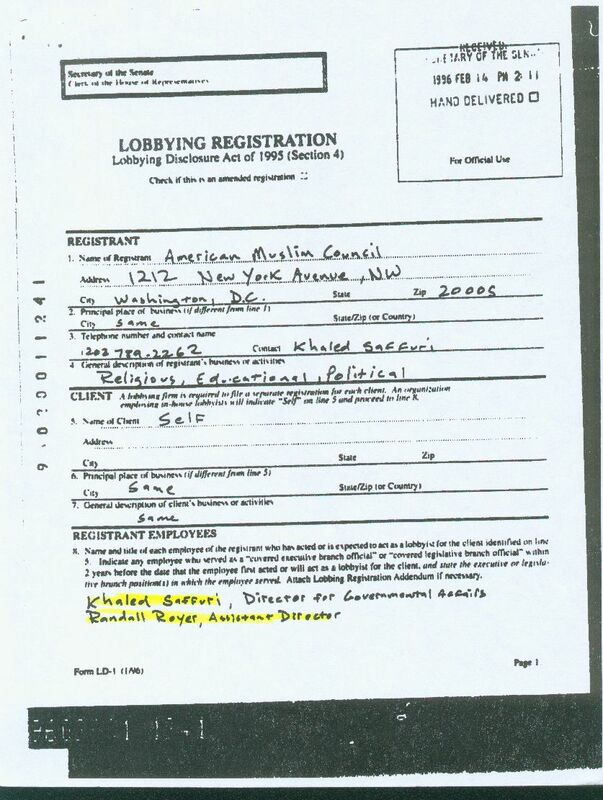 Saffuri got his start in Washington, D.C. as Alamoudi’s deputy and chief lobbyist of the American Muslim Council. As I noted here at PJ Media two years ago, one of the most important events that Alamoudi and Saffuri were responsible for was the first White House Iftar dinner that they arranged in 1996 for then-First Lady Hillary Clinton. Cooperation between the two didn’t end with Saffuri’s new organization, nor was Alamoudi the only problematic element for Saffuri’s operation. A lobbyist at Norquist’s firm, Janus-Merritt, has solicited pro-Qatari op-eds from at least one conservative pundit. When the emir of Qatar came to Washington, Saffuri hosted a Capitol Hill luncheon in his honor. Another achievement for the Alamoudi-Saffuri alliance was a meeting that they had in 2000 with then-GOP presidential candidate and Texas Governor George W. Bush and Karl Rove. Meanwhile, fresh from their success with both the Clinton White House and the Bush family, Alamoudi began showering politicians of both parties with campaign contributions. That all came to a screeching halt when Alamoudi was stopped in September 2003 at Heathrow Airport transporting $340,000 in cash. Deported back to the U.S., he was arrested at Dulles Airport. Alamoudi was then charged with, and later pleaded guilty to, playing the role of bagman in an assassination plot by Libyan intelligence — with the assistance of al-Qaeda operatives — to kill then-Saudi Crown Prince Abdullah by attacking his motorcade with RPGs. He admitted he had received the cash from Libya and had traveled to the country illegally on another passport in violation of U.S. sanctions. Alamoudi is currently serving a 17-year federal prison sentence. Not only was Khashoggi not some “liberal reformer,” those driving the ship in terms of painting the picture of what happened in that consulate are just as connected to the Muslim Brotherhood as he was, not to mention an al-Qaeda operative that had previously tried to assassinate the Saudi crown prince. Jamal Khashoggi wasn’t some hippie journalist bravely speaking truth to a big bad dictator. In reality, he was/is deeply connected to the Muslim Brotherhood and their various tentacles throughout the world, and was seen as a legitimate threat to the Saudi throne. Additionally, he had/has deep connections to Islamist groups that have a very big stake in hurting the Saudi royal family, as well as damaging US/Saudi relations. Bear in mind I am NOT excusing his murder, if that is indeed what happened. But with all the information not being reported regarding his background, we must take into account that we’re not being told the entire story. In any analysis, one must take inventory of who had the most to gain, as well as who had the most to lose. In this instance, President Erdogan of Turkey and his close Iranian allies are the clear answers to both of those questions. Erdogan, fresh off a defeat over Andrew Brunson and an economic standoff with the US generally, surely knew that one of his al Qaeda-connected inner circlers was providing info to the American media. And he certainly knew the chaos it would cause in US/Saudi relations, which his buddies in Iran and Russia are undoubtedly celebrating. It very well may be that MBS had this “journalist” killed, but there is a lot more to the story that we aren’t being told. If the story regarding the Apple Watch recording is true, we need to see the evidence. If the Saudi consulate was bugged (it almost certainly was), again, we need to see the evidence. And then, once the claims are proven, we need to know the whole story. The real story. Then, our president can proceed accordingly. Go get the facts, PDT.